Air Compressed air is an indispensable source of operating and processing power in all areas of industrial and technical production. The compressed air is generated by raising the pressure of large volumes of ambient air. Usually this air contains harmful substances, such as dirt particles and moisture in the form of water vapour. The water vapour condenses and can lead to operational breakdowns and considerable but avoidable costs. To prevent production downtimes compressed air must be clean, dry and oil-free. 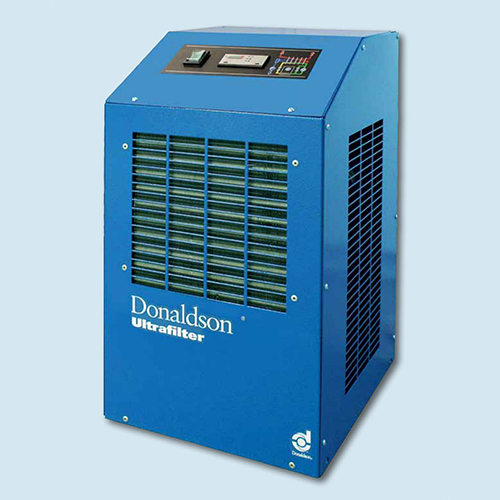 The refrigeration compressed air dryers of the Buran range, dry the air to prevent condensation and corrosion damage. The dryers in a robust metal housing are equipped with an electronic level controlled condensate drain and a dewpoint indicator. The aluminium heat exchanger includes three functions in one: air-to-air heat exchanger, refrigerant- to-air heat exchanger and water separator. Hereby an especially compact design is achieved.